Site Collection– A site collection is a top-level site and all the corresponding sites below the top-level. 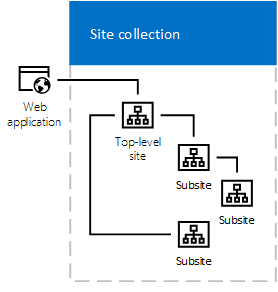 Your site collection is your neighborhood within your SharePoint Tenant (community). Site– Sites are created in a site collection to break up information like a house within a neighborhood. You can have different features on different sites, appearances, features that are specific to the users of the site. Site Templates– Sites in a site collection can use different types of templates. Think of a manufactured home, and the room templates offered. Self-Service Sites– The Self-Service Site works great if you want to keep security straightforward within your sites. This method works best when you want to give users access to a request or function without making the process or permissions complicated. The Crow Canyon Power Portal is a great example of a Self-Service Site. Subsites– Really any site created in SharePoint is a subsite. The only true site is the top-level site. In most cases companies will use this as an Intranet or Homepage. Then have the subsites sit underneath like an IT Helpdesk, Facilities site etc. Navigation– You can optimize your site’s navigation by setting up specific navigation links to each site with in your site collection. Site navigation is a relationship between the sites within your site collection. The roads that connect your community and the houses within the neighborhoods. Security– You can set specific permissions and define user groups for each site. Who is allowed to see what in each house. Permissions– Regulation on which users can access to the site and in what manner. User Groups– Custom security groups that can be applied to specific SharePoint sites. This is how users can access sites. Page– A page is a container for content in SharePoint sites. When a site is added, a page is automatically created for you, and that page becomes the top level of the site. Branding– Each site can have its own branding. Site Layouts– Each site can have a unique layout of how the web parts are displayed on the page. Search– You will be able to apply unique search settings to each site. I.E. you can make it so that some sites do not show in search results. Web Part– A web part or widget provide the structure to a SharePoint page. Web Parts have a predefined set of capabilities that can be added to any page. There are different layouts that can be applied to each page to hold all types of web parts. Example web parts are displaying content of a list, a calendar, a task list, a blog and all this can be done without coding. SharePoint List– A list is essentially a spreadsheet stored within a SharePoint Site. The information in a list is stored rows and is widely regarded as the best way to store information in a SP Site. Each row within the list is a called a list item. For example, in a help desk site, each ticket would be their own row. The list may have also multiple columns where you can store information against a list item. Going back to our help desk example, the columns for the ticket may be Name, Department, Email, Category of request etc. Lists can be used in many ways. You can use a list as mentioned above to track requests, tasks, discussions or even company-wide events. List Template– SharePoint provides several list templates out of the box. You use these templates to create new lists on your pages and site. You can also create a custom list template, save and reuse that list template across the site. List Item– An item is an individual entry within a SharePoint list. Each list item can have multiple columns associated with it depending on the list it is contained within and, depending on the content type of the item. Forms– Makes information more easily viewable on a list item in a tabulated or sectioned form. Conditional Formatting– This is a feature which allows you to apply a format to a cell or a range of cells based on certain criteria. For example, tickets or request can be highlighted red when they are overdue. List Column– An area to store information against a list item. Lookup Column– Allows a user to view to navigate to other lists related to the list item. IE Help Desk tickets related to an Asset. Metadata– Essentially, this data about data. Most commonly viewed within a list column. Content Type– This is a unique combination of columns that apply to various content within an organization. View– A way to display items or documents in SharePoint lists and Libraries. Dashboards– A view that displays all users and groups relevant information. Dashboards are designed to report on data and or information collected within the list/site. SharePoint Library– A library is to a site as one drive is to Microsoft. A place where you can store, share, upload, collaborate on documents with department/team members. A library displays information pertinent to each library item. You can see who last modified the document or even link lists items to a library item. Library Types– Various types of libraries are created when you create a site. Document, Asset, Wiki, Form etc. Folders– A collection of documents stored in a SP Library. Documents– Items stored in the SP Libraries. Documents can be stored, edited, checked out as well as copied to other libraries. Version History– Allows you to view any changes made to a SharePoint List Item or Document within a SharePoint Library. Check Out– Allows users to check out or lock a file/item that they are editing. Wiki Page Library– Create procedures, policies, instructions, guidelines or other content. For example, a Knowledge Base within a site. Workflows– The automation of business processes, where business documents and tasks are passed automatically from one user to another for action, according to a set sequence. Alerts– These are notifications sent to users when a change to an existing piece of information or new information is added within an item or a list. For example, a notification alert can be sent out when a ticket is assigned to a technician or to an end user when a technician has been assigned to their request. Site Mailbox– You can connect an Exchange mailbox to a SharePoint site so that you can store and view emails and attachments. For example, Tickets or Requests be created in a site by end users. Excel Import– Crow Canyon has an excel import tool. The tool provides UI to select source excel file and target SharePoint list and has UI to map the excel columns with SharePoint list fields such that it reads information from Excel file and create items in selected SharePoint list as per the field mappings. Survey– This feature is an out of the box feature that allows users to reply to a list of questions specific to the type of request. IE a service survey after the completion of a help desk ticket.